Here are details on the peplum dress I made and wore to the April bloggers' event! Inspired by a few classics from this spring and last winter...love the pepulm for party dresses! Blake Lively in Jason Wu! Just found this one on Pinterest. Not sure what the story is, but... Emma Watson. I knew I wanted a basic bodice so I used my fave Simplicity 2444. 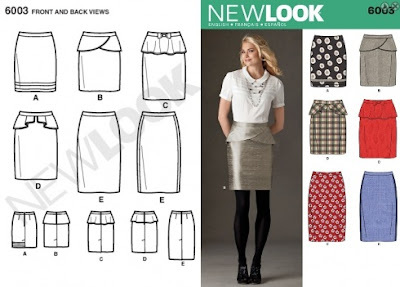 The skirt was a basic straight skirt, and I could have done the peplum without a pattern, but I had this near-perfect pattern, New Look 6003. It hits at the high hip, so to make it work with the natural waist of the bodice I extended it a few inches up, making sure it matched the waist size of the bodice. And here it is on, at the Portland bloggers' event! More on the outfit here. So--verdict? Loving the peplum trend!! So fun! Have you worn a peplum skirt, dress, or top yet? I don't love the trend but I LOVE it on you! The trend isn't for me, but you look lovely in it! Your version is very much like Jason Wu's. I like the black and "old gold" fabrics together. I think the peplum trend works for smaller girls with narrow hips. Not for bigger girls with curves (like me). It just adds more to an area I'd rather minimize. But I'm jealous of the trend!! I wish I could wear it! Very cute! You did an excellent job. I'll be so happy when I can sew that well. Fun! I like this a lot! I'm not a big fan of peplums for myself (I don't have the confidence to pull them off), but you look adorable! Thanks! I think I only do for parties! Oh, very cool, how fun! I love the peplum trend, your interpretation is really great (I'm a big fan of the Alexander McQueen peplum garments aswell!). I absolutely love the colour of the gold fabric! Thanks! I'll have to check those out! Aaw, thanks. No orders but free advice! I love it when haute couture trends turn out to be so wearable. I haven't tried on a peplum dress yet, but after seeing how yours turned out, I might have to. Thanks! Me too, I did feel pretty high fashion-ey! So cute! I love how you didn't make it too poofy. You've renewed my faith in the peplum dress. Ooh, that's good to hear! It was very easy to wear! I really like how it came out! Great job. It looks flirty and classy at the same time. And I highly recommend you try a peplum on sometime--they really are fun! I LOVED that dress on you! The fit was so perfect! That silk color looks beautiful on you, more champagne than beige, right? You look fantastic, I like that bodice paired with the skirt /peplum shape. Yes, like dark champagne... sort of warm rock-colored, haha. An earth tone, maybe. Thanks! I like the covered-up bodice thing and peplum, too! Good combo of proper vs. fun! I, like you, is a peplum nut! I love them!!! It's a great nod to the classics and you look fandabidosa in them!! !